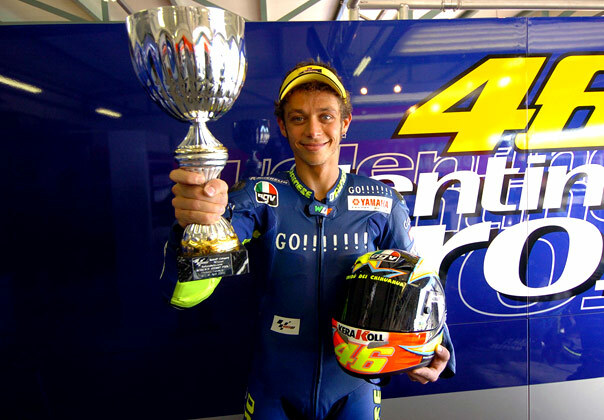 Rossi Interview - race | Yamaha Motor Co., Ltd.
Valentino Rossi reviews his MotoGP 2010 season. This is my last appearance for the Yamaha website and it brings a mixture of emotions, but mainly when I think back about the last seven years it brings a smile to my face. 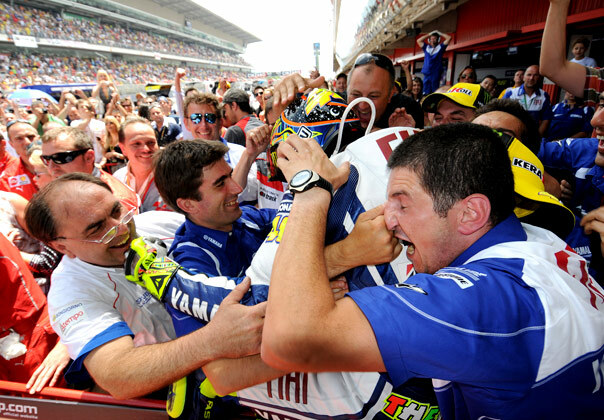 In these pages I have talked about some great victories, some great achievements and some great memories with Yamaha. This season has not been an easy one, but we have had some wonderful moments together and to finish the story with a podium in Valencia was a happy ending, I think. To start off with, I think it is fitting to talk about my podiums with Yamaha – my best three moments from seven wonderful years. In third spot I would put last year's race in Barcelona, the great battle with Lorenzo and the overtake in the last corner, which was unbelievable. I can honestly say that this was one of the best and hardest wins of my whole career, a great, great victory because it went to the very last corner. It was a move I dreamed about for two weeks before the race and it worked. I had to be very brave and take it right to the limit in order to beat Jorge and it was one of those wins that was about much more than just 25 points. 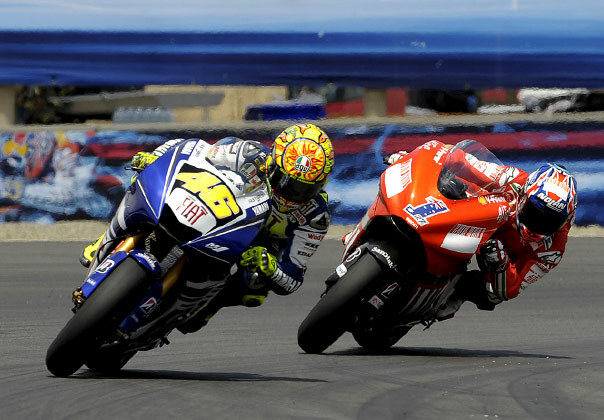 Laguna Seca in 2008, the battle with Stoner, was a similar kind of victory but more important and this is why it is in second place on my all-time Yamaha podiums. I remember I got a good start and I was able to pass Casey in the first lap. I knew I had to try and stay in front of him and it was impossible to relax even for one second! I don't know how many times we changed the lead but it was a lot and it was great, great racing for me and I think also for the fans. It was my first win in America, a country I love, and a big emotion. Psychologically, it was a crucial victory for the championship because the pressure was on Casey and he made some mistakes in the next races that proved to be decisive. That championship in general was very important for me because we won the title for the first time since 2006 and proved to everybody else and to ourselves that we could still do it. However, for me the greatest Yamaha memory remains the first one in Welkom. This was the great highlight of our history together. The win over Max Biaggi in the first race of the season was something we could never have imagined. I became the first rider to win back to back races on different brands of machinery and after an intense winter of testing we announced to the world that Yamaha was ready to fight for the title. It was a nice race, with lots of good overtaking and a great battle with my old rival Biaggi, which made it even more special. I felt good for my mechanics, who had all followed me to Yamaha, and to the factory for the faith they had put in me and the way they had responded to my requests for the bike. Thinking about that race in South Africa takes me back to the start of my long relationship with the Yamaha YZR-M1 and I want to take this opportunity to reminisce about my beloved bike. I remember she was a bit ugly to start with! The first thing I wanted to change was the colour, so we put some of my yellow on the blue of the sponsors and in the end I thought she looked beautiful. Underneath the fairing the chassis was already great, as you would expect from Yamaha, but we had a lot of work to do – to find some stability under braking, more rear grip and most especially more performance from the engine. Mr. Furusawa prepared three different versions for me to choose from and we went for one that had less power than the previous version but it had more feeling, it was smoother and easier to ride. 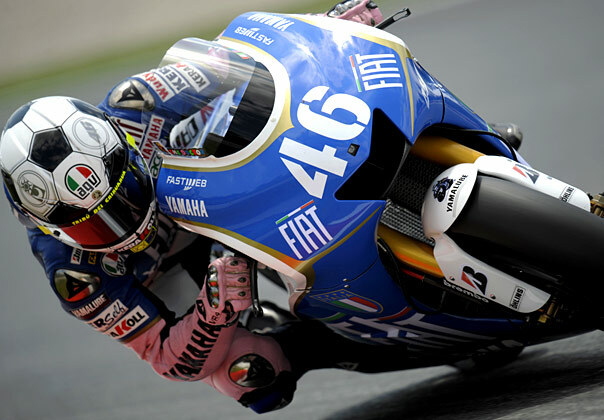 From there, Yamaha worked step-by-step on improving the power and we were able to win the first championship. The 2005 version was probably the best M1 I ever rode. It retained the agility of the 2004 version but the engine was a big step forward. It was still smooth and sweet but it had much more power and it was very fast on the straights. The best way to describe it was that the 2004 bike was a work in progress, but this was the finished product. The bike was very precise in every way, it had a new cowling design to improve the aerodynamics and in my opinion it was the most beautiful looking bike of our time together. It had great balance, it was easy to ride a nd we were able to find a good setting very easily and we won eleven races on it. We tried to improve the bike in 2006 but unfortunately we created a big problem. We tried to improve the agility and turning but w e also cr eated a lot of chatter. In hard braking and fast corners the front of the bike made a lot of vibration and became almost impossible to ride. The harder I pushed it the more high-frequency the vibrations became and it was very easy to lose the front. It cost us the first part of the season and it was a shame because the bike had great potential – the engine was very strong. Once we understood it we fixed our problem and with some good victories we managed to return to the battle for the title. Unfortunately we also had tyre issues towards the end of the season with Michelin and some bad luck, and then in the end we lost the championship in Valencia with a crash. Still, I have good memories of that season – like coming from eleventh to win at Sachsenring. The first year of the 800cc era in 2007 was not a good one for us and we found ourselves with a familiar problem – engine power. Some of our rivals were at a clear advantage from the first race in Qatar and although we improved throughout the championship Stoner was able to build a big advantage and we did not react in time. Thankfully the 2008 version was a big improvement and we were able to win nine races and the championship. Firstly the engine was more powerful but also the fuel consumption was better, which enabled us to manage that power effectively. Yamaha had done a lot of work on the software so we felt major improvements in the anti-wheelie, anti-spin and traction control but also we could control more the behaviour of the bike corner by corner. The change from Michelin to Bridgestone meant that we also had to work a lot on weight distribution but we got the best out of them and won the championship again, which meant a lot to me as I mentioned before. 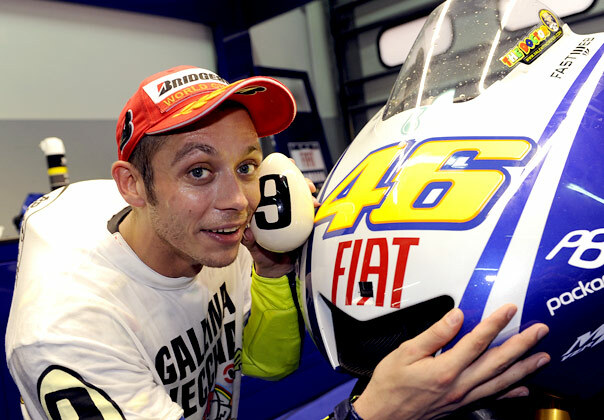 In 2009 the bike didn't change a lot because the 2008 version was so strong, it was already a winning machine. The advantage we had was that we had data from a full season on Bridgestone tyres but again the main improvements were in the software, which now allowed us to adapt the settings to lots of different situations - like changing grip levels due to heat, cold or especially wet conditions. The 2010 bike was again very similar but the rules changed and the big difference was that we had to do 18 races on just six engines. Yamaha concentrated a lot on this, to make an engine with more or less the same power but with more endurance. This was a hard job, especially in the first season, but again they came up with a winning bike – just unfortunately not with me! Of course I also had the biggest injury of my career in 2010. The crash at Mugello was a stupid mistake and I remember when I hit the ground I thought I had broken my foot. Then I looked at it and saw the position of the foot and realised it was actually my leg that was broken! Thankfully I never actually saw the bone sticking out of my leg and that was a good idea I think. From that moment everything changed for me. I had to stay calm, quiet and focused on getting my career back on the right path, which was a huge challenge. Now the path of my career will change so you can understand that after all we have been through together leaving my M1 behind at Valencia was very emotional, like when a love story finishes. From 2004 to 2010 we made it faster, more clever and more beautiful so it was hard to say 'Bye Bye Baby' last Sunday. We have had lots of good moments together but also some bad ones and after a long, long period together it will be hard to start again from zero. However, it is also exciting – just like when you start with a new girlfriend! I have to say that my good relationship with Yamaha is not just about the bike. I have also forged some wonderful friendships with the people in the factory and I will miss them a lot. It is thanks to these friendships that I have been able to begin testing with my new bike early and I am very grateful to Mr. Nakajima, Mr. Furusawa and everybody else for allowing this to happen. I also want to thank everybody back at the factory in Hamamatsu for all your hard work over the past seven years. Our success could not have been possible without it and you have all played an important part in a wonderful love story that I will always remember.